Big-leaf mahogany (Swietenia macrophylla) was sourced in British Honduras (today called Belize) and was sold by the trade name Honduran Mahogany. This has led many to believe that the wood was grown in Honduras. Much of it was, but it was also being harvested in a range of other places, from Mexico to southern Amazonia in Brazil. It is one of three species that yields genuine mahogany timber, the others being Swietenia mahagoni (West Indian mahogany) and Swietenia humilis. Illegal logging of S. macrophylla, and its highly destructive environmental effects led to the species' placement in 2003 on Appendix II of Convention on International Trade in Endangered Species (CITES), the first time that a high-volume, high-value tree was listed on Appendix II. Mahogany has a straight, fine, and even grain and is relatively free of voids and pockets. Its reddish-brown color darkens over time and displays a reddish sheen when polished. It has excellent workability and is very durable. Historically, the tree's girth allowed for wide boards from traditional mahogany species. Mahogany’s inherent physical properties have made it the favorite wood of cabinet-makers and other master craftsmen for five centuries. Mahogany is exceptionally strong for its weight, outranking any of the woods that could possibly substitute it as a medium weight wood in structural applications. Tonally, the best Honduran Mahogany delivers a lively, detailed response, balanced, with a warm character, excellent bass, and vocal midrange. The trebles are rounded yet detailed. Both in electric and acoustic guitars, a mahogany bodied guitar will offer a focused, powerful tone, with the fundamentals in slight preeminence over the harmonics. It is often paired with a Maple top, to add some openness and sparkle in the top end. Thanks to its light weight and strength compared to its relatives, Honduran Mahogany is the favorite choice of instrument builders but is very hard to find today. African and Spanish mahoganies are often used as a replacement for Honduran Mahogany. In the picture: Reclaimed Honduran Mahogany we sourced for necks.  © B&G Guitars. by Customer Support Theme.